TIDDOX supplies an absorbent pad that works exclusively with oil-based fluids. Some automotive, car care, and industrial applications require that you dispose of all oil-based refuse in a specific way. With TIDDOX's OIL ONLY ABSORBENT PADS, you can isolate specific spills and dispose of the materials in the way designated. These pads absorb any fluid such as fuel, diesel, chemicals, solvents, paints, and oil. The pads are water-resistant, though, so they will not fill up with water. This makes it more affordable, since water runs off, leaving oil residue behind. Each pad will hold up to 1 litre of oil-based fluid. As a superior performance pad, it is highly regarded by the marine and automotive industries, as well as by industrial manufacturing facilities. It can be messy and even dangerous to soak up a spill, only to have the cloth you used come apart. It leaves little specks of fabric behind to be stepped on and tracked all over the shop floor. In some cases, as you carry the inferior product to the disposal, it can create a fire hazard. That’s why TIDDOX's meltblown polypropylene material is far superior to so many cloths and wipes. This is a low-lint fabric that does not deteriorate when saturated with oil-based chemicals or solvents. Brake fluid, transmission fluid, antifreeze – all will soak into this material without disintegrating the weave. When the pad is saturated, you can carry it to disposal without pieces of it falling off. 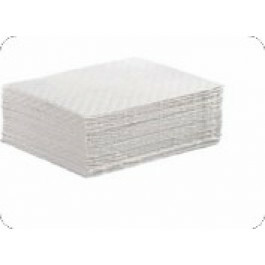 In some cases, you need our SUPERMAX ABSORBENT PADS which are a version of the GENERAL PURPOSE ABSORBENT PADS. They absorb water and oil equally well. However, there are some cases in which you need to allow water-based fluids to drain away, retaining only those with an oil-base. This is the pad for oil, petrol, and diesel. Since it rejects water, your pad will not get saturated with harmless water. Instead, it will absorb only the more toxic oils that have to be disposed of carefully. These OIL ONLY ABSORBENT PADS measure 53cm X 38cm. This rectangular shape covers a longer section of flooring, making it useful for automotive work on drive shafts and engines and for industrial machinery. Most of our products here at TIDDOX are suitable for use in multiple industries, and the OIL ONLY ABSORBENT PAD is no different. Any situation in which you may have oil leaks, chemical spills, diesel or paint spills, or solvent accidents, this pad will contain the mess until you can fix the point of failure. Since they hold 1 liter of oil products, they can be moved from one location to another until they are fully saturated. Customers who use our OIL ONLY ABSORBENT PAD tend to keep them in stock for emergency situations as well as for everyday use. A breakdown in a mechanical unit need not contaminate your entire workspace.